the great MUG exchange is up and running. Meet Brittany. I met the lovely Brittany when I began exploring the blogging world. Her story was an encouragement to me and I've been challenged by the joy she has in God. She loves to meet new people and share her life with them. Hi there friends! My name is brittany, but you can call me britt! I write over at Bee Littlequeen where I sure do keep busy all while mostly being barefoot! I love my family & friends, blogging!, cheese omelets, paper products galore, sunshine, asparagus, dark chocolate, makeup and taking lots of pictures to document my life! The mug that I really wanted to get a mug shot with was my "paris" cup. My mom gifted it to me from Paris...the Paris Hotel in Las Vegas that is in 2008. So I had my paris cup and it faithfully got sipped from nearly daily, but last year (in 2012), I dropped it and it chipped and it's life ended in the garbage! Thankfully for Christmas, I happened to receive TWO new coffee mugs to replace the two that I had broken in the year: one being a white mug with a purse on it and a little bling, the 2nd being a handcrafted, beautiful, sea green and blues painted mug displaying a whale in the sea gifted (again) by my mom to ME made by a co-worker of hers. It's the third week of January now and I've had about one month of bonding time with the white, blingy mug. Everyone in my house knew that this mug was my mug. This particular mug is pretty lightweight, taller and more slender compared to the whale mug that is wider and more stout (hmm, sounds like I'm describing myself lol)..
"I am a little tea pot, short and stout, here is my handle , here is my spout..."
anyways, because the blingy mug seems to hold more drink, i've been primarily using this one. Thankfully, I felt inspired to take some pics with my new blingy mug (JUST YESTERDAY-saturday) in preparation for my mug short story for sweet Tygre. Now I'll have pictures to look back on and cherish the short lived memories of me and my blingy cup (not that I got really attached to it or aything?)! Thanks for "hearing" and reading my MUG SHORT story! 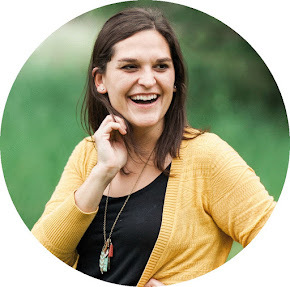 Two of my favorite posts I've written that you can check out are sorting out my thoughts and figuring that God is able AND a funny memory involving a lego bucket! Stop by my little corner of happy ('cue Walgreens') or send an email my way. I love making new friends! Be sure to check out Bee Littlequeen (and don't forget to wish her Happy Birthday)! More mug shots coming soon. Check out the exchange details here if you'd like to join in. Courtney and her husband are ol' friends from back in the college days. She recently created some wonderful cards to do with their son. 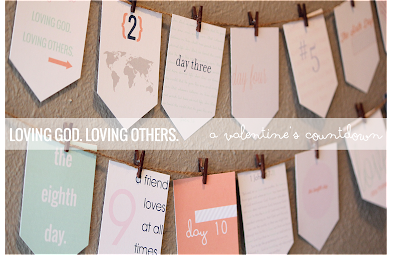 Each of the cards has a different activity to do on the days leading up to Valentine's Day. The activities are aimed to teach kids about loving God and loving others. You can check it out and print these lovely freebies here! Share a pic of you with your favorite cup o' joe. Tell us your mug's story and why it's unique. Meet and greet other bloggers. I've really enjoyed meeting other bloggers and I'm always encouraged by their desire to share life and give advice and encouragement along the way. 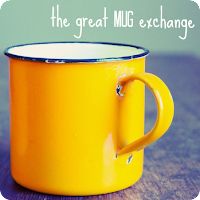 I'm excited to try out the great MUG exchange to give everyone an opportunity to meet each other! The blogger with the most creative mug shot will win a $25 Amazon.com gift card! 1.) E-mail me a brief intro about yourself, along with your mug's story and picture. Make sure that you're in your mug shot with your cup o' joe. Include two links to two of your most favorite posts you've written. 2.) 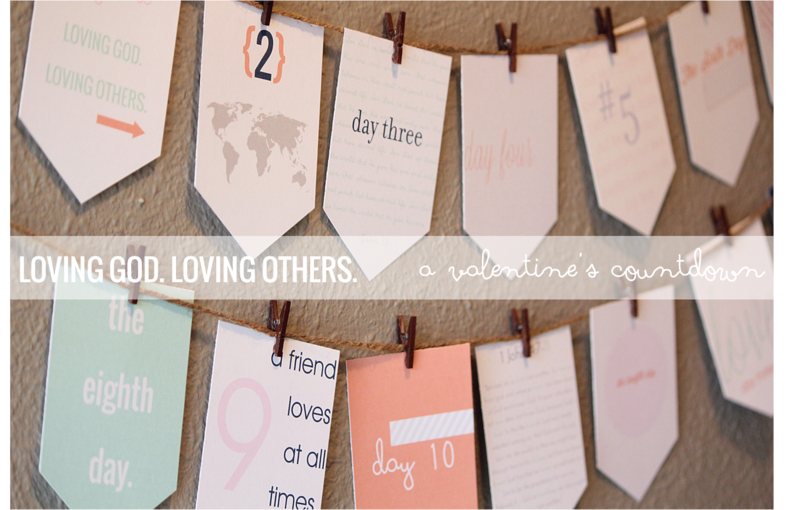 Visit other blogger's sites as they're posted throughout the week and make sure to leave them some love! 3.) In the end, all of the participants will have the opportunity to purchase (or give away) a mug to one other blogger, depending on their style. (You'll have to check out each other's mug shots and blogs to figure out their style!) You won't have to purchase anything, but I thought it would be a fun memento to have of our meeting. 4.) Whoever comes up with the most creative mug shot will be the proud owner of a $25 Amazon.com giftcard. I'm excited to see your pictures and hear your stories! I recently posted a picture of my fetish on Instagram. 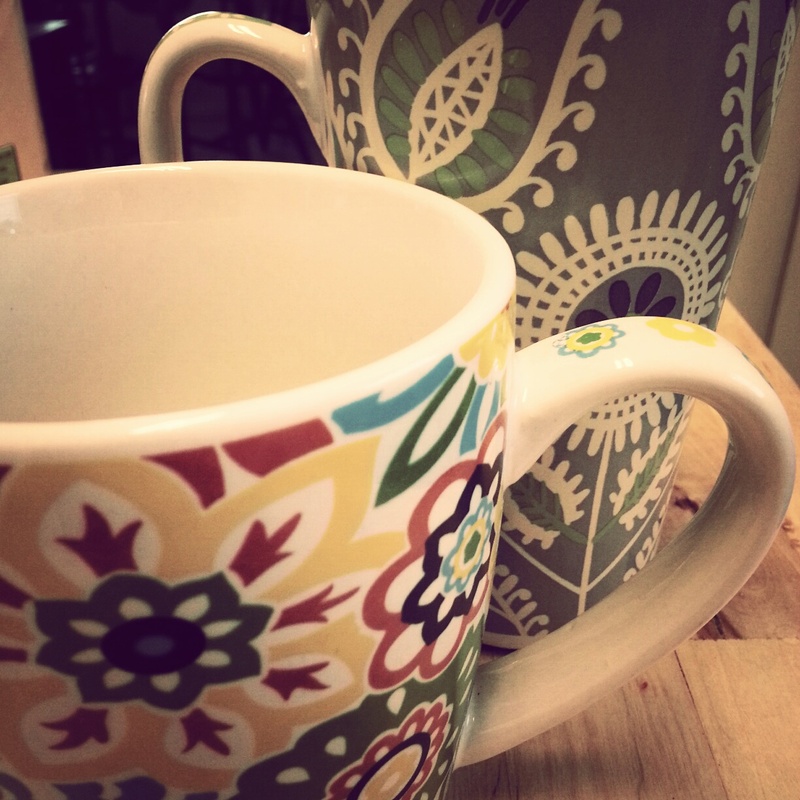 I may have a small obsession with fun, coffee mugs, especially if they are a cheap buy. More importantly, I carry a fun memory with most of the coffee mugs we use. This past winter break, I went shopping with my mom and my brother's girlfriend (Sis-in-law is way easier to say. Hint, hint bro). 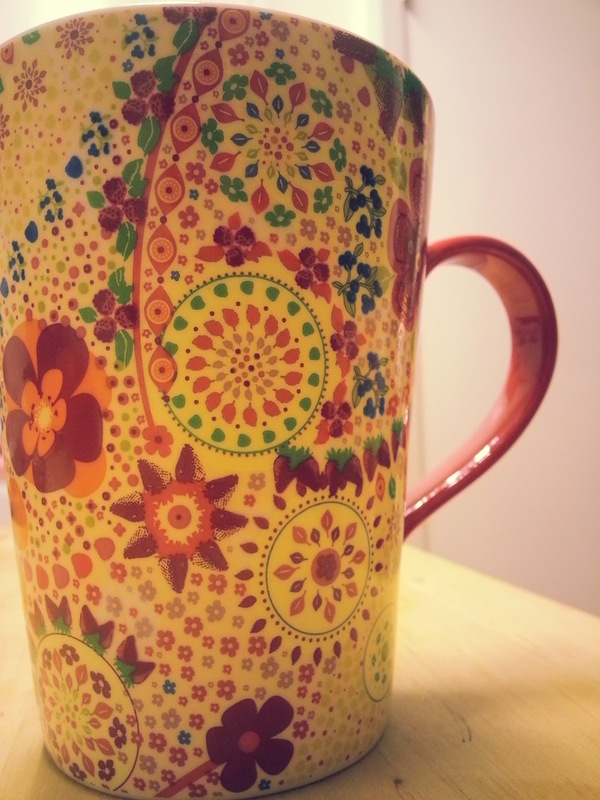 I always forget that Ross has artsy fartsy and fun coffee cups for a super deal. I'm that girl that walks straight to the clearance section in the back of the store. I'm pretty cheap when it comes to buying things, and you have my attention if your price tag says $2.99. I'll reminisce 2012's Christmas visit with family in Corpus when I sip some joe from these two ornate cups. My flower hippie cup, as I like to call it, is from Riverside, CA. 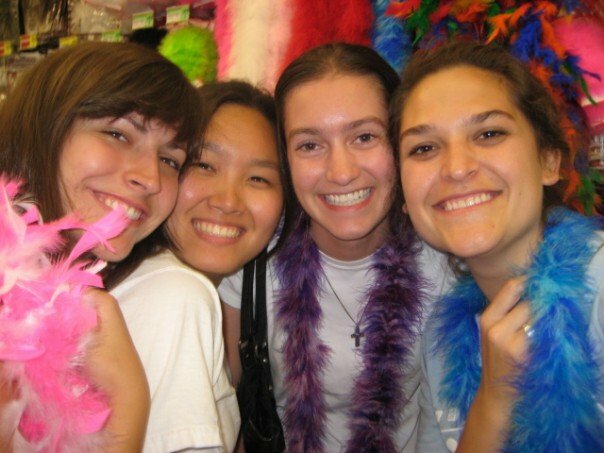 In the summer of 2007, I lived in Riverside with twenty other college students and took part in a Christian discipleship training program (Project Impact). We all got jobs and learned how to biblically live in community with one another and share our faith with others. We attended local churches and helped serve in their community too. When we weren't at work or the beach, the other ladies and I would go and sit at Starbucks often and talk about work, school, the bible, and boys of course. 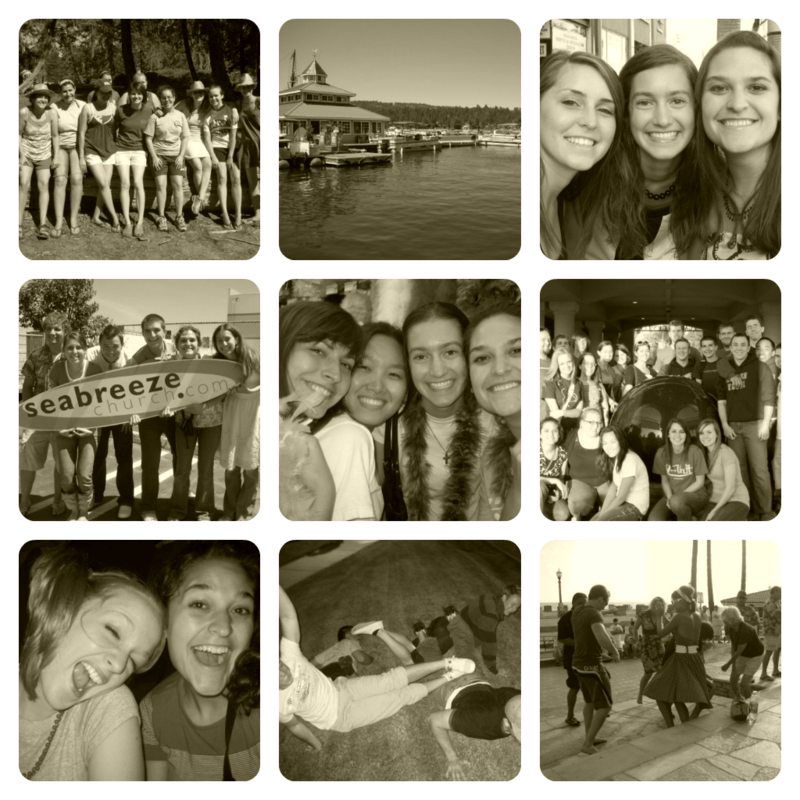 That summer was near and dear to my heart and I'll always remember the fun times I had with sweet friends. You'll have the opportunity to show off your favorite mug and share your story on the blog. Mae retold this story to me the other day with a loud voice and wide eyes, as she sipped her hot cocoa. The point we hope to convey to Mae and Deacon is that God is powerful and sovereign. He gave life and he also gave Adam and Eve all that they needed, yet they still chose to disobey him. Our kids are used to hearing, "No, no no! Don't hit!" or "No, no, don't eat that." They are constantly hearing "commands" from us, but how do we make sure that we address the right way to act too? Normally, we'd follow up with a question like, "But, what did Adam and Eve do?" or "Well, did Adam and Eve obey God?" God tells us not to do certain things, but why? God gave us commandments so that we could joyfully have life in him and him alone. First commandment, numero uno: "You shall have no other gods before me." l i v e t h r o u g h h i m."
Our intentions aren't simply to tell Mae and Deac, "Hey, we made you, so obey us always. Boom." Sure, that would be fabulous, but we know that we will not ever be able to give them everything that they need. We also know that we, along with our children, are prone to make mistakes and disobey. Ah, the hard truth. Lately, bible stories about sin have been coming up a lot. We have found ourselves in rough situations when we try to explain, in "kid" lingo, how sin came to be or why Cain killed Abel or why God destroyed everyone on the earth, but kept Noah and his family safe. Mae really digs the bible story about the princess (go figure...) that finds baby Moses floating in a river too. We mentioned how a king wanted to kill this baby, but God kept him safe. We've had to explain many, many times why Mae shouldn't hit or yell to her brother's face. Deacon has taken a few swats for practicing his soccer-ball kicks at mommy and daddy or for taking a swing at sister's face. It is comforting and reassuring though to reflect on God's constant goodness amidst our sin and the trials that we will face. 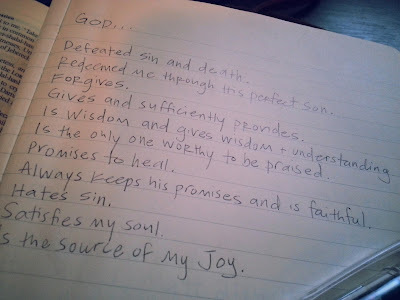 I am not to focus on myself, but rather the perfection of God. I am beyond grateful to serve alongside Tod and teach our children about a holy and loving God. "'When they saw the star, they rejoiced exceedingly with great joy'. I cannot avoid the impression then that true worship is not just ascribing authority and dignity to Christ; it is doing this joyfully... that being near him to ascribe authority and dignity to him personally is overwhelmingly compelling." -J.P.
Numero uno, I hope to joyfully rejoice in my Savior so that His character reflects in the way I parent, learn, teach, grow and serve. These are truths that I need to remember daily! What about you? "Mae, we need to show brother what we're not supposed to do. Wait, I take that back..."
P.S. A while back, I wrote a little bit about our house hunting experience. Welp, we're moving soon! Praise God for his continued blessings. I hope to post pictures soon with some helpful tidbits about the process and packing for the move!